Woo-hoo! 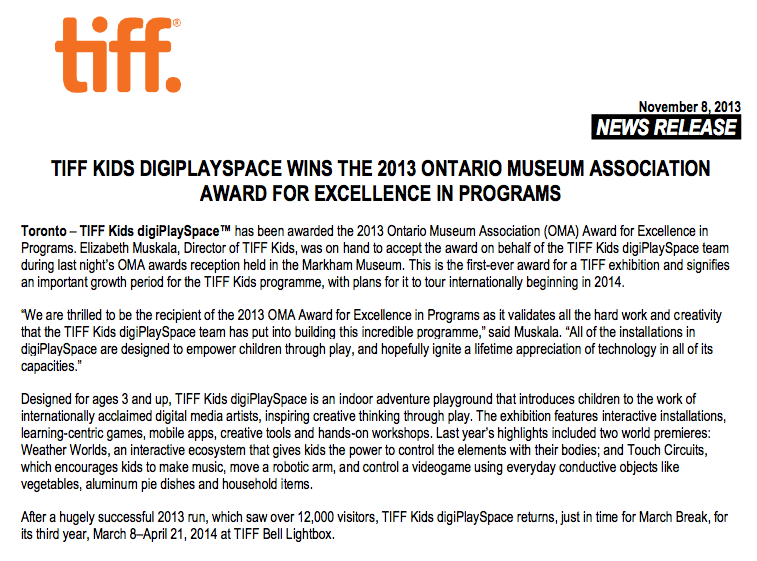 The 2013 TIFF Kids digiPlaySpace (curated by Nick Pagee) won the prestigious Ontario Museum Association Award of Excellence in Programs. Read more on the Ontario Museum Association Website. The OMA Award of Excellence in Programs is presented to individuals, institutions, corporations, or agencies for programming that creatively engages new audiences, or provides exemplary service to existing ones. Over a six week period–from March 9 until April 21, 2013–over 12,000 Ontario family and student visitors experienced one of the world’s most innovative media exhibitions for children: TIFF Kids digiPlaySpace. Located in a 4,000sq ft gallery at TIFF’s facility, TIFF Bell Lightbox, digiPlaySpace invited children and youth, along with their friends and families, to partake in interactive adventures filled with laughing, learning and engagement with media technologies, installations, learning-centric games, mobile apps, new creative tools and hands-on production activities.